Our first week back from Holland has flown by! I have had the camera trap up on our front gate every evening since we got back. Time for the second Tales of the Trailcam of 2019! First I have to tell you something though… retrieving the trail cam every morning and checking what the camera caught is like opening a Christmas present each and every day. It is so much fun!! I hope you enjoy the findings with me. 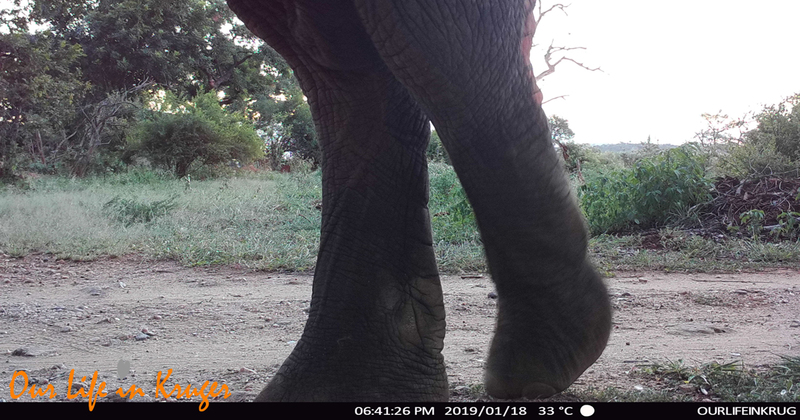 This elephant was pacing up and down during the day attracted by the marula fruit. The lush green vegetation is also attracting a lot of impalas. We see big herds wonder past the garden almost every morning. Both at the front and at the back of the house. I just love watching them from my bedroom window or from the kitchen. Plenty of impala around every day. The Vervet Monkeys either sleep in the trees above the safari tents next door, or in the Jackal-Berry trees on either side of our gate. This past week, they have been bunking by us and they climb our fence late every afternoon. The next morning there is a virtual monkey poop minefield at our gate and I have to tread carefully not step in any of it when I open the gate to take Alex to school. Any suggestions on how to persuade the Vervets to permanently take up residence someplace else are very welcome! Vervet Monkey coming to sleep in the trees at our front gate. Interestingly, I have caught quite a few hyenas walking past the garden. I have only seen one during the day a few months ago, but our Trailcam reveals they (Or maybe it is the same one each time) come around more often than I initially thought. Hyena walking past our front gate. My last find had me in stitches… Our gorgeous Jack. Mister Lips. We got back from checking out mating lions late one afternoon. Steven wanted to adjust our floodlight at the gate a bit and the boys were ‘helping’ him. I guess Jack found the green box on our gate very interesting! I have compiled a short movie clip of some of the video’s our Trailcam took. The footage of the hyena and the elephant right by the camera was very nice for me to see! Steven is going to take our Trailcam with him on trail this week. Let’s see what the camera reveals there after the sun goes down! I will report back at the next episode of Tales of the Trailcam. Linda, you are so blessed to be able to bring your kids up in that beautiful part of Africa. When they are grown up and leave the nest they will always remember their childhood with very fond memories and yearn to return. I speak from experience when I was Manager of a Lodge in the Pilanesberg for many years. It really is the best place to grow up Philip! I am glad your children got to enjoy the lifestyle too! Pilanesberg is a lovely place! Yet again a thoroughly enjoyable read. Fabulous viewings..especially the cute one of Jack! As for the monkeys..what a nuisance,hope they move on soon. I am still in London..a sunny but cold 2C morning here. I know, Jacks picture was a funny surprise! Please let me know if and when you will be joining Hannes here in SA. Maybe we can meet up this time around and swap BA KLM stories! Great read Linda. I loved the video clip you compiled and also the little cutie you discovered when browsing through the night’s offerings! It’s certainly quite busy outside your front gate at night . . . . I hope you manage to pick enough marulas to make several jars of jelly before the ellies get to them! Enjoyed this one a lot….I really miss Kruger and need to find an opportunity again this year. Thank you, Francois! I hope you get get to the BPOE soon! So exciting. I simply love your blog. Derive vicarious pleasure reading every word. Thank you. Thanks for the compliment, Michael!